How safe is the water you drink? For the 45 million Americans who get their drinking water from private groundwater wells rather than a public utility, the answer is decidedly murky. The Environmental Protection Agency regulations that protect public drinking water systems don't apply to privately owned wells, leaving owners responsible for ensuring their water is safe from contaminants. "This co-location emphasizes the need to determine the frequency that hydraulic fracturing activities impact groundwater well water quality. This knowledge is important to maintaining high-quality water in many domestic wells," said co-author Jasechko, an assistant professor at UCSB's Bren School of Environmental Science & Management. 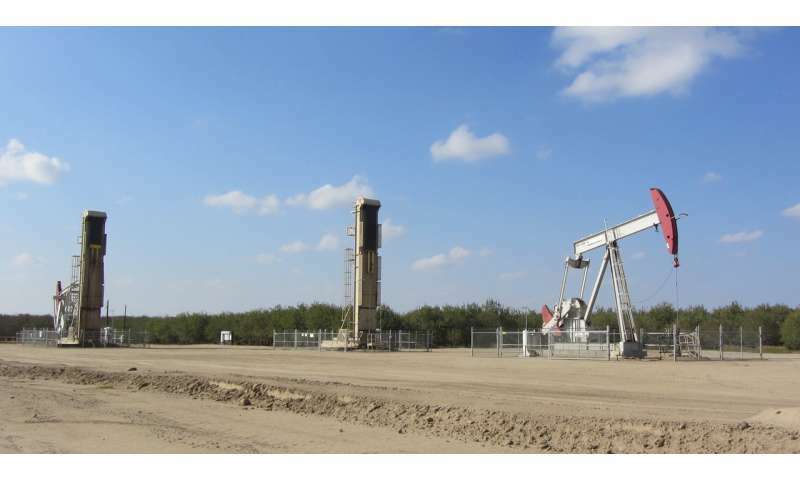 "Our results underscore the importance of increased water monitoring efforts near both hydraulically fractured and conventional oil and gas wells in ascertaining the risk of contamination and in protecting water well quality." Jasechko and Perrone charted the data on a variety of maps, one of which tracked hotspots. "These hotspots are areas where, in light of potential contamination mechanisms, limited resources for assessing spill frequency and well integrity could be used more effectively and efficiently," explained Perrone, an assistant professor in UCSB's environmental studies program. Perrone noted that some hotspot areas include not only hydraulically fractured but also conventional oil and gas wells, which are more abundant. "We can use these hotspot analyses to focus resources, so that we can learn more about oil and gas contamination mechanisms: How often do they occur, and do they have an impact on groundwater?" she said. "Our analysis underscores the need to increase monitoring efforts to maximize the probability that we can identify well waters that may be impacted, and do our best to remediate, contain and isolate potentially contaminated waters before they cause harm," Jasechko added. "We can consider stronger policies that include requirements for repeated groundwater quality testing of the many domestic self-supply wells that exist close to hydraulic fracturing." "One policy recommendation would be to have a national standard for data collection on groundwater well construction," Perrone said. "On the energy side, a national standard for data collection for both unconventional and conventional oil and gas wells could provide opportunities for increased transparency across jurisdictional boundaries." Most sewage treatment plants exist within 2 to 3 kilometers of domestic groundwater systems. What??? Don't you get Mackita's point? We can't even find out what crap they are pouring down those holes. It only proofs that the petrol businesses have our elected officials by the short hairs. We know what crap is being flushed down toilets and poured down sinks, part of which produces megatons of grit which is disposed in landfills. "When landfill waste degrades and rain rinses the resulting products out, leachate is formed. The black liquid contains organic and inorganic chemicals, heavy metals as well as pathogens; it can pollute the groundwater and therefore represents a health risk." - Of course. And most landfills "exist within 2 to 3 kilometers of domestic groundwater systems". Leachant quantity is many orders of magnitude above that of fracking operations. And the poisons found in leachant are much worse than fracking fluids. And the trip down into water tables is much shorter and easier than the one up from fracking zones. So you've got to ask yourselves what it is that tickles your fancy about fracking while polluting at far greater scales is going on. Both concerns need addressing - one doesn't excuse the other. Frankly I pity the common people of Texas for being so submissive to official corruption. The paarable of the Ants and the Grasshopper comes to mind.